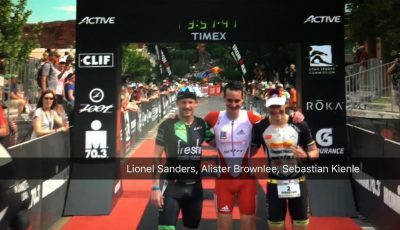 Only one week after a finish well off the podium at the IRONMAN European Championship Frankfurt, Cyril Viennot stormed to the win at IRONMAN UK. The 35-year-old finished slower in Bolton than he did the previous week in Frankfurt, however this weekend he reversed his fortunes to lead him to a convincing win in Bolton. He came out of the water in fourth place behind his compatriot Romain Guillaume (well known as a strong swimmer and biker). But it was on Guillaume to lead the race only for about a third of the bike before Viennot decisively moved to the front. He came off the bike with a huge lead over British Will Clarke and looked extremely focused. Viennot eventually was able to put a consistent marathon on track to take his second win in Bolton after 2014. Lucy Gossage had to fight a tough battle to take her third consecutive and fourth win since 2013 in Bolton. “It is my hardest win here and it makes it even sweeter,” said Gossage after the race. Being a bit behind in the water, the two-time defending champion paved the way to the victory especially on the final 30 kilometers of the bike. She passed Germany’s long-term leader Diana Riesler and opened up a gap of 2:30 minutes until she reached T2. Gossage was able to stretch her lead on the first half of the run, but Riesler fought back really hard. 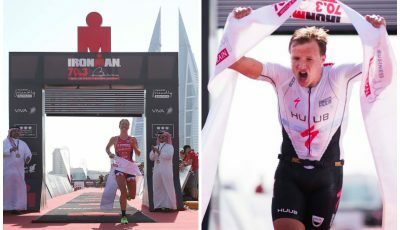 The women’s competition became really close, but ultimately, Riesler wasn’t strong enough to kick the IRONMAN UK queen off her throne. The swim portion of the race was cancelled due to frigid temperatures, but that didn’t dampen the competition in Racine on race day which ended up being a 56 bike and 13.1 mile run affair. Sam Appleton (AUS) wasted little time knocking out a race-best bike split on the day and for good measure backed it up with the day’s fastest run. The winning combination netted the Aussie the win over the 2016 IRONMAN 70.3 world champion, Tim Reed (AUS) and Joe Gambles (AUS) who grabbed third. 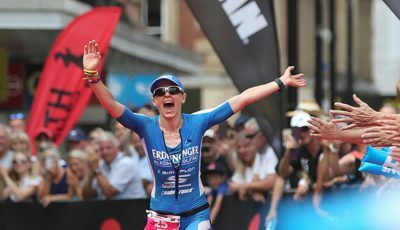 The women’s race showcased the reigning IRONMAN 70.3 world champion Holly Lawrence (GBR). In typical Lawrence fashion, she laid it all out on the bike and carried a 3:40 advantage on the field heading into transition. Someone forgot to tell Jodie Robertson the race was over who proceeded to claw back time to the leader for the entire run but came up 57 seconds short after the 13.1 mile run. 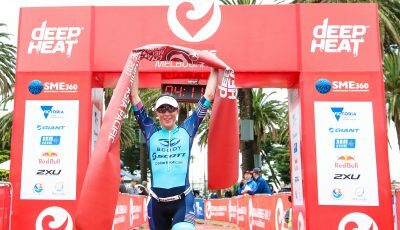 Lawrence continued her 2017 IRONMAN 70.3 win streak with her 3:39:31 clocking.